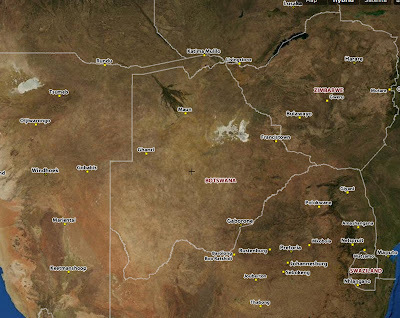 From Livingstone, Zambia, we headed west by truck to the border between Zambia, Namibia, Botswana, and Zimbabwe. It was as chaotic as I expected any African border to be. It was also packed. 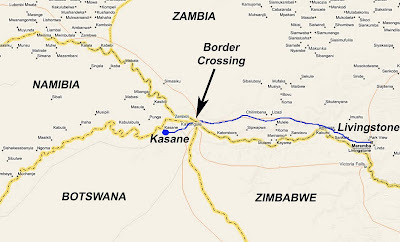 Once across the Zambezi River, we boarded a land cruiser and headed for Kasane, Botswana. Seeing the map same map as above, but the aerial photograph version, it is startlingly clear how the rivers define the country borders. 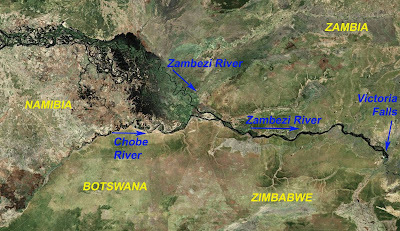 The northern Zambezi River (flowing southeast) is the border between Namibia and Zambia. 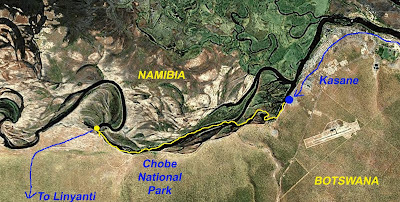 The Chobe River (flowing east, and meeting up with the Zambezi) defines the border between Namibia and Botswana. The Zambezi River is also the border between Zimbabwe and Zambia. Once in Kasane, it was the Chobe that we turned our attention to. We hopped onto a river boat and headed upriver. To the south, we viewed Botswana's Chobe National Park, known for its massive elephant herds. We were not disappointed on the loxodonto africana front. We learned a thing or two about the rotund hippopotamus (Hippopotamus amphibius) on this trip: namely, that they are responsible for killing more people in Africa than the other ferocious beasts (lions, crocs, cape buffalo, etc). I also learned that their four tusks (not teeth, as I had been previously calling them) are quite handy for snapping people in two. Lovely, eh? Despite these statistics, they’re still one of my favorite animals. It is rare to see them out and about during the day, as they typically leave the water only at night to forage on tasty swamp grasses. The Cape Buffalo (Synerus caffer) herds will often oust older, past-their-prime males. These elderly gents will form small groups of like-minded geriatric males as a protection against lions. A week later during a walking safari, we encountered a pair of grouchy buffalo. It was adrenaline inducing, to say the least. Fortunately, this guy (below) was viewed from the safety of the boat. There were crocodiles (Crocodylus niloticus) aplenty. And each time I thought of this event. Had you been feeling adventurous, you could have literally reached from the boat and given this big fella a nice friendly pat on the schnoz. Not sure how he would have reacted, though. In Africa, they call these birds the African Darter (Anhinga rufa) or the Snake Bird. In the United States, particularly Florida, we call them anhingas. They look rather snakish though, don't you think? Ah, the hippos, once again. Ok, back to the animals. Here we have the lovely Kudu (Tragelaphus strepsiceros). This is the male version of the kudu (note the nifty horns. Or perhaps they're antlers. Not sure). He was a striking fellow. But it appears he could use the kudu version of the dog wash. He has some mud on his horns. I could go for a nice kudu burger right about now. This, I believe, is a Yellow-Billed Stork (Leptoptilos crumeniferus). He didn't much care for us, evidently. And the fearsome looking Marabou Stork (Ephippiorhynchus senegalensis). That is one hell of a mouth full of a scientific name. And this lovely creature is currently unidentified. Perhaps we could use some help from the Africa Safari contingent. We spotted this antelope-like thing on the [very, very long] drive to Linyanti Camp, once we had left the Chobe River. If I had to guess (based on pictures from google search), I'd venture to say that this fellow is a Steenbok (Raphicerus campestris). But don't take that as absolute fact, please. And yes, there were elephants. This is a relatively rare African Skimmer (Rhynchops flavirostris). My, what a large beak you have my friend. love the hippos! there is a christmas song to about wanting one from Santa. Oh, I envy you this trip! A few years ago, I got hooked on watching the National Geographic wildcam at Pete's Pond in Botswana. I'd stay up until the wee hours of the morning to watch the dawn influx of birds. There was a very active forum and a group of us that tried to identify all the birds the camera would focus on. To be able to see those beautiful birds live has got to be wonderful! You would love Botswana. My parents are big birders and I keep telling them that they HAVE to go, that it's a once in a lifetime trip. Funny, but I completely overlooked the birding aspect when we were planning the trip. Most of my excitement was focused on the 'big stuff', you know, lions, elephants and other large beasts. And they were cool, don't get me wrong. But I really enjoyed seeing and photographing the birds. If you go, and you like birds, I would highly recommend that you visit the Okavango delta. This swamp has more birds that you can shake a stick at. It was birder heaven. Some of my favorite pictures were from this portion of the trip. I've also heard that going during the wet season is better for birds as well; not so great for big game though(since they tend not to congregate around the water holes during this period).